Sunshine in the form of muffins, that is what these are. The inspiration for these comes from amazing sunshine corn cakes from Clementine. They are delicate, crumbly and have a bit of a crunch from the gritty corn. They have a sweet zesty touch from thick bits of orange throughout the muffin and a lovely thin slice of orange baked on top. Those are sunshine corn cakes. Inspired by these delicious beauties I picked up some super sweet blood oranges from the farmers market this weekend. 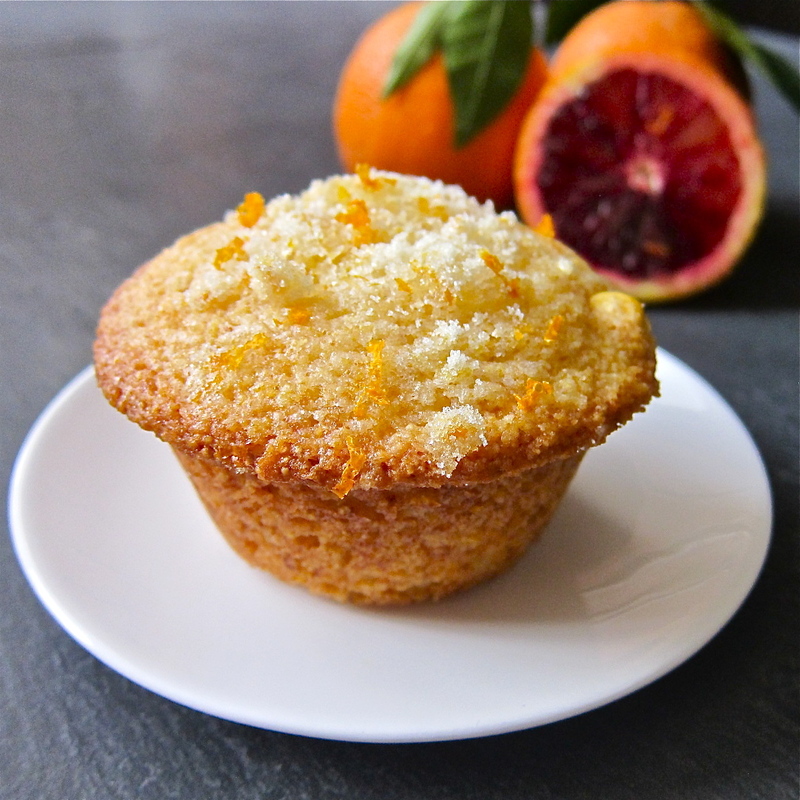 Blood orange plus corn meal and flour make a perfect muffin. My muffins use blood oranges rather than regular oranges. Let pulp, more juice and zest. They are bright, sweet and bring a little sunshine to your morning! Preheat oven to 400 degrees F. Butter or spray muffin pan. Using a large bowl, whisk together flour, cornmeal, sugar, baking powder, baking soda and salt. In a separate bowl whisk together buttermilk, melted butter, oil, egg and blood orange juice and zest. Pour the liquid ingredients over the dry ingredients and with a rubber spatula gently stir ingredients together until just combined. Divide batter evenly among muffin pan. Bake in oven for 15 to 18 minutes or until tops are golden and a toothpick inserted into the center of the muffin comes out clean. Remove muffins from oven and allow to cool completely. what a delightful combination! LOve the cornmeal contrast! i love blood oranges! these must be amazing! These muffins are lovely! I haven’t ever tried corn muffins with citrus and the blood oranges are so appealing here. Absolutely gorgeous and so creative. Mmmmm, these muffins look bangin! LOVE love LOVE blood orange anything.